In the last few months, Sefaria.org has added several tens of thousands of new links to the site, mostly through judiciously crawling the wikitexts archive. The combination of human-scale translations and data-scale linkings is fascinating – the sheer number of links would take ages for a person to do, but as time progresses, we must be approaching the maximum number of links that can be added algorithmically. I’d mentioned, in a previous post, that there’s a huge difference between collecting exact quotes and subtle allusions. It would be interesting to see what happens to Sefaria as it moves towards discovering the latter. However, it’s also pretty interesting to see the evolution of the former. So, when last we left Sefaria, they were at 87,000 or so links between texts. By August 25nd, they had over 150,000. By September 22nd, they were up to 300,000. So my first question, as you might imagine, is as follows: assuming that I use the same layout algorithms for each, how do the graphs compare to one another? These three graphs were all created using the force directed OpenOrd layout algorithm in Gephi, mostly because it’s the only layout other than isometric that can really handle this much data. Arguably, the first thing we’ve proved is that Alexander Galloway is right in The Interface Effect, “Only one visualization has ever been made of an information network, for there can only be one” (84). Galloway observes that the style and structure of network visualizations all look the same or, more accurately, all use the same aesthetic codes to say the same things and what they tend to say is that this object is big and interconnected—each image fundamentally exists as a symbol of the network without any kinds of representation. Which leaves me, as a reader and student, with two series of questions. The first—which I am going to hold off on answering until my final post in which I plan to discuss questions of worth—asks what the aesthetic and poetic value of these visualizations are? What, in the strongest sense of the term, do we do with them as objects that speak about an archive or even as objets d’art? But we’ll get to that later. In the mean time, let us ask a different kind of question. If we take each graph as the symbolic representation of algorithm working on data, how do we use that representation to reorient more traditional forms of inquiry? This is part of the humanities’ continued break with what I think of as the ordinary uses of data visualization wherein the purpose of the image is to convey to the human eye what the algorithm has learned. It’s a method of displaying new knowledge that has been interpreted by virtue of having been computationally mediated. But these visualizations work slightly differently. While their job is still to show us Sefaria’s output in a manner readable to our eyes and brains, they exist as the starting point in humanist inquiry rather than the purpose of it. I see these graphs as pointers, methods of discovering or uncovering areas in the network that are of interest to scholarship. 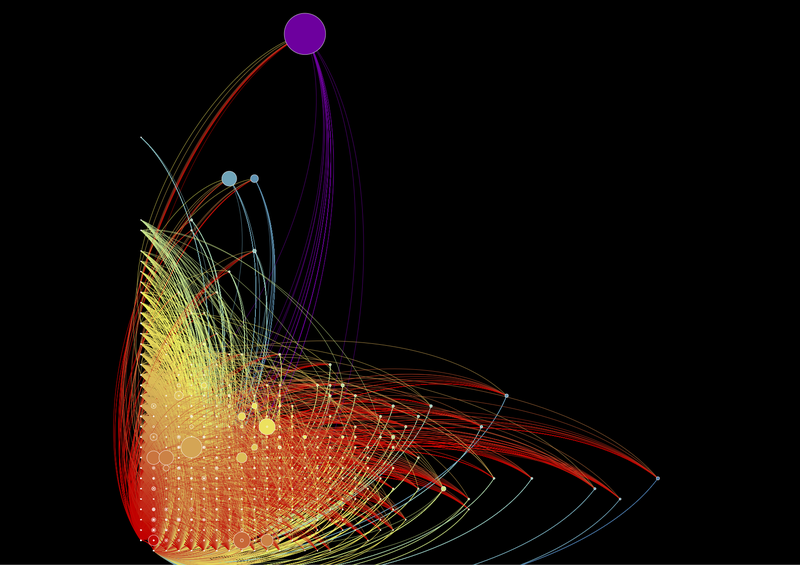 The visualizations, taken separately and together, are a way of telling us to look here. Why is this node different from all other nodes? When we line up these three images, which look more and more like the multicolored Eye of Sauron, how do they draw our attention and what inquiries do they suggest? – What is the node that looks like a lens flare on the right-hand visualization? 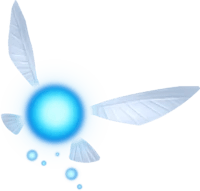 – Why do each of this images have a halo? – Is the largest node the same in each of these images? – Why do I only remember to check the repository at the end of the month? So these are questions we can answer, except perhaps that last. I will take on the first two. The lens flare, interestingly enough, is a single chapter from Tanna Debei Eliyahu Rabbah. If you were expecting something a bit more well-known and your response was “who now?” rest assured, you’re not alone. I was surprised too. Tanna Debei Eliyahu is a work of midrash, which means that it uses biblical verses to craft narratives and make arguments about the nature of the world (rather than, say, use them as prooftexts for legal decisions). David Stern describes it as an “exposition of themes and ideas, but one whose coherent presentation is always being sidetracked by the lure of exegesis” in his book, Parables in Midrash. So why does its 18th chapter have so many edges stretching out of it? As to why, the simplest answer is because that chapter refers to an astounding 113 different verses in the Bible. Nothing else, as the graph shows us, comes close. The passage in question begins with an exegesis of a verse from Lamentations and can be found here. For context, the other chapters have between 3 and 35 biblical quotations in each section. So there’s a research project for someone interested in Midrash. Is there something unique about the contents of this chapter that matches the odd data we’ve gleaned about it? Why does this section require so many prooftexts? Are those texts similar across the entire section or is there an evolution of their content? Of course, I’m not in the business of interpreting Midrash, at least not at this point in my career. The rather serendipitous revelations of this research remain as pointers. So much for micro-level drilling down. Now let’s go back and take this opportunity to look at the evolution of the archive. 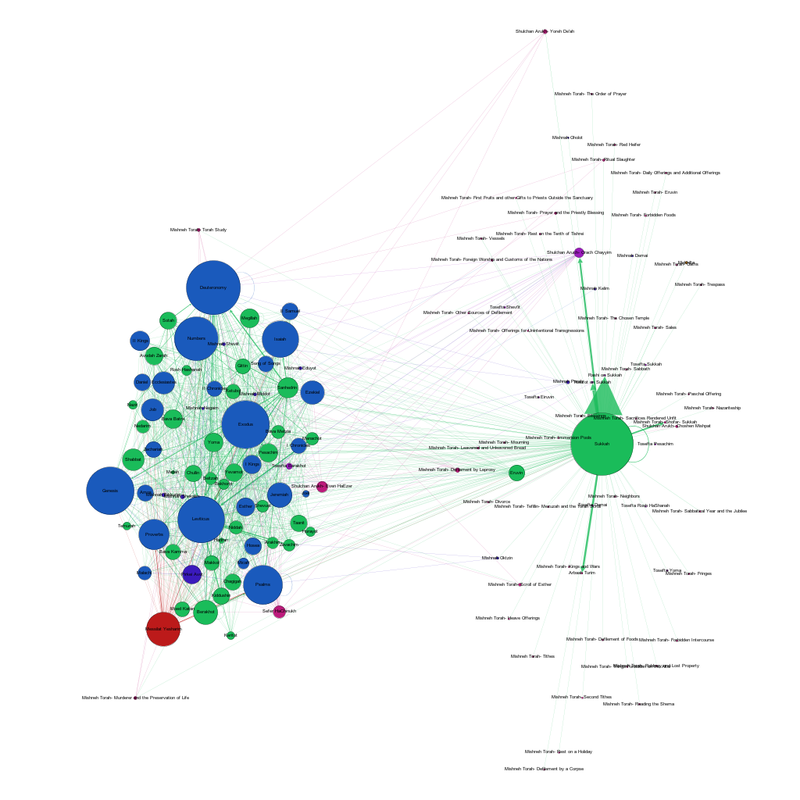 This graph is a testament to Sefaria’s growth, but more importantly to us, it shows what the database looks like as it approaches a more accurate representation of the interconnectedness of Jewish texts. What strikes me as interesting, at least in this network, are the regions of growth. The centers become denser and more intricately connected while the halo around the outside remains the same diffuse constellation it had been more or less since the beginning. According to that view, the nodes around the outside remain the same, while new nodes add themselves in to the central cluster. Given the scale of the images versus their pixel density, I went back to Gephi itself to check the compositions of each one. 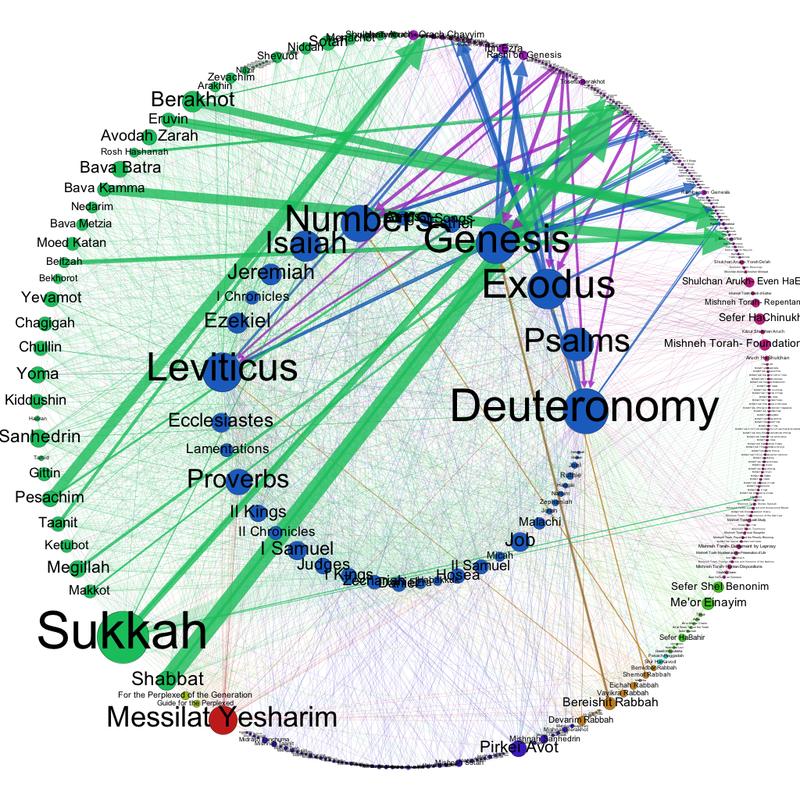 In the May graph, the outermost ring is composed of less prominent Biblical verses and their commentaries, along with the occasional Talmudic fragment that comments on them. The inner ring, on the other hand, comprises the Talmudic pages that lack links to anything other than their own commentaries. The August graph works on the same obscurity principle and, despite appearances, the presence of a text in the inner or outer ring is determined by how many edges it has. The inner ring is made of texts with several connections to other texts that make up their own little clusters, mostly fragments of the Talmud or biblical verses. On the other hand, the texts in the outer ring tend to have only two or three edges. They’re just packed more closely together, which is what leads to the thicker looking band of color. Whether a cluster ends up in the inner sphere or in one of these outer rings is determined by both the number of edges and whether one of those edges connects to the massive nodes in the center. And, finally, we reach the September graph. Again, same basic principle, but the contents are slowly shifting inwards. 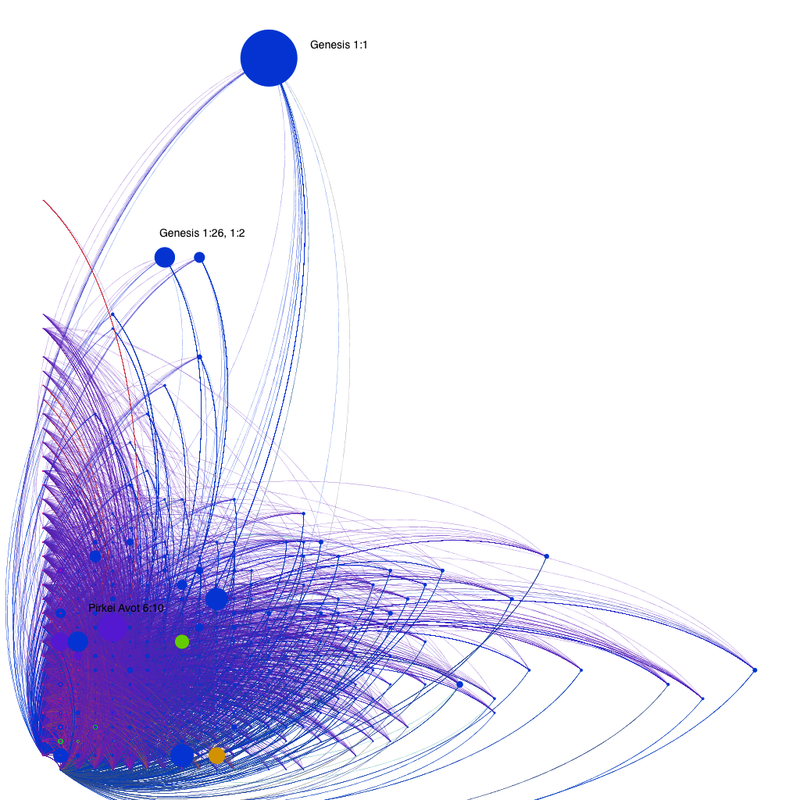 Nodes that, in previous graphs, appeared in the outer circles have now gained access to the inner sphere (where they have been indoctrinated in the secret mysteries of graphs practices, no doubt), while the outer ring includes commentaries on and translations of biblical verses (which tend to only have one edge, to the verse they are translating). This suggests that, as new nodes are added, earlier nodes with fewer edges make more connections and gravitate towards the center of the graph while some of the newer, more obscure nodes, take their place on the outskirts. Alternatively, the nodes themselves retain the same number of connections, but the nodes to which they are connected gain more edges and they are drawn to the center by that connection. One very popular biblical verse can draw in an extraordinary number of commentaries, each of which only connect back to that verse. 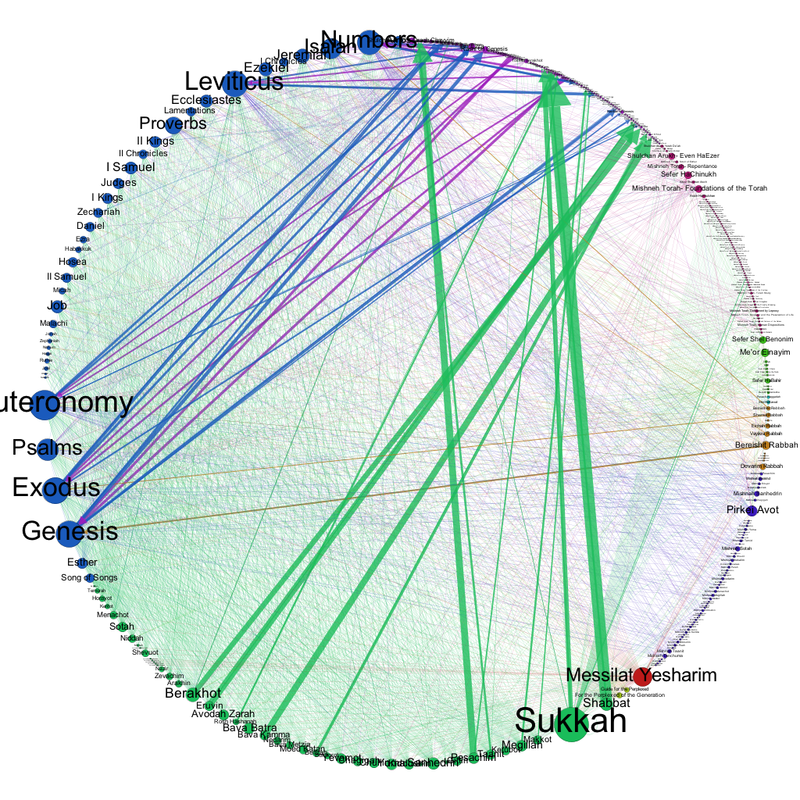 There is a point at which this will have to stop; the nodes currently in the outer circle are quite unlikely to build sudden networks of communications, given that the Aramaic translations, for example, are rarely referenced within the literature. I’m not surprised to discover that Sefaria’s database was built up in this fashion; the earlier iterations were more interested in setting up the database with texts that readers would likely want to reference. Pseudo-Jonathan was probably not a priority. If the previous question drew our attention towards the anomalously overconnected, this question turns our gaze towards the obscure. Texts like the Aramaic translations catch my eye because they are precisely the kinds of texts I would expect to find in the far outer reaches of the graph. What else is out there? Are there any similarities between the texts with few connections? And what kinds of similarities might we look for? The appeal of big data (for a given value of big) is that it promises us the possibility of looking at the ordinary en masse rather than extraordinary exemplars. The problem is deciding what to do with the ordinary now that we’ve found it. I considered looking at only the nodes with 20 edge or fewer, but that turns out to be 99.2% of the nodes. My next step was to reevalute my definition of “a few edges” and I went back to the graph with what I thought was a more reasonable number. Going down to 4 edges brought me all the way to 92% of the nodes visible, but less than 20% of the edges. 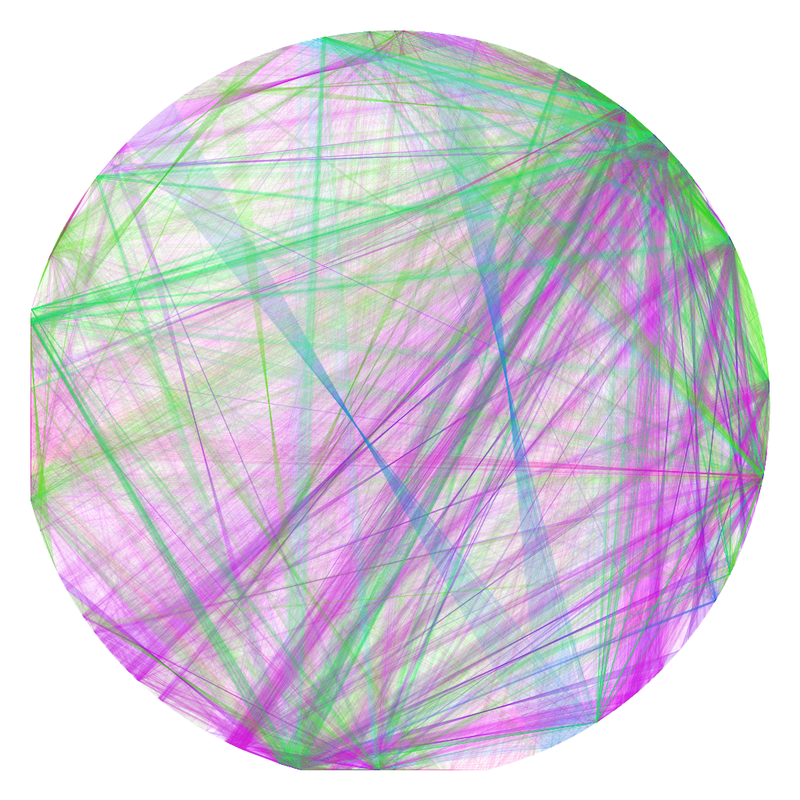 And, finally, 75% of the nodes on the graph only have one edge. That’s about 228,000 nodes out of 305,000. As a note, fewer than 5% of the edges are part of this graph, which means that 25% of the nodes are responsible for 95% of the edges. Percentage-wise, most of the commentaries are dead ends. Which is to say, they have one edge and that edge connects to the biblical verse upon which they are commenting. Interestingly enough, the same is true for the Halakhic writings. 70% of those texts only have one edge. Which suggests a chain of transmission that only references the conclusions of a previous work and that only has its conclusions referenced by the next in the chain. And given that we are working with with individual verses in the Bible and sections of sections in Halakhic literature, it’s not surprising to find such divisions. On the other hand, only 3% of the Mishnaic nodes have just one edge. Given the rest of the graph, that is rather an anomaly. My first impulse was to blame the Babylonian Talmud (as one does) except that only accounts for 37 of the 60 tractates. Then I remembered that the absence of the Jerusalem Talmud from my scholarly interests does not disqualify it from having an effect on the graph. And yet both the Babylonian and the Jerusalem Talmud leave out the entire order “Taharot” with the exception of one Tractate. If one sixth of the Mishnah remains uncommented, shouldn’t the number of nodes with only one edge be higher? Apparently not. I was still inclined to blame the Gemara’s selective nature for this particular graph, but it pays to be thorough. I checked the list of the Mishanyot with only one edge and, while the majority of them were from the minor tractates not discussed in the Babylonian Talmud, there were still random sections of the Mishnayot even in the more well known tractates, such as those dealing with marriage, damages, ethics. So there’s another question for another researcher. What is so strangely uninteresting about these sections of the Mishnah? Finally, I want to return to Tanach as I found those results to be anomalous in a different direction. I found it hard to believe that 37% of the verses in Tanach have only one edge, which is to say that only one commentator or translator has taken the time to interpret them. My instinct was right in this case. Sefaria counts translations as part of “Tanach” rather than as commentaries, despite the translators Onkelos and Jonathan taking full advantage of translation as a form of interpretation. So when I checked how many of the Tanach nodes were actually translations, I found that the number was roughly 33%. 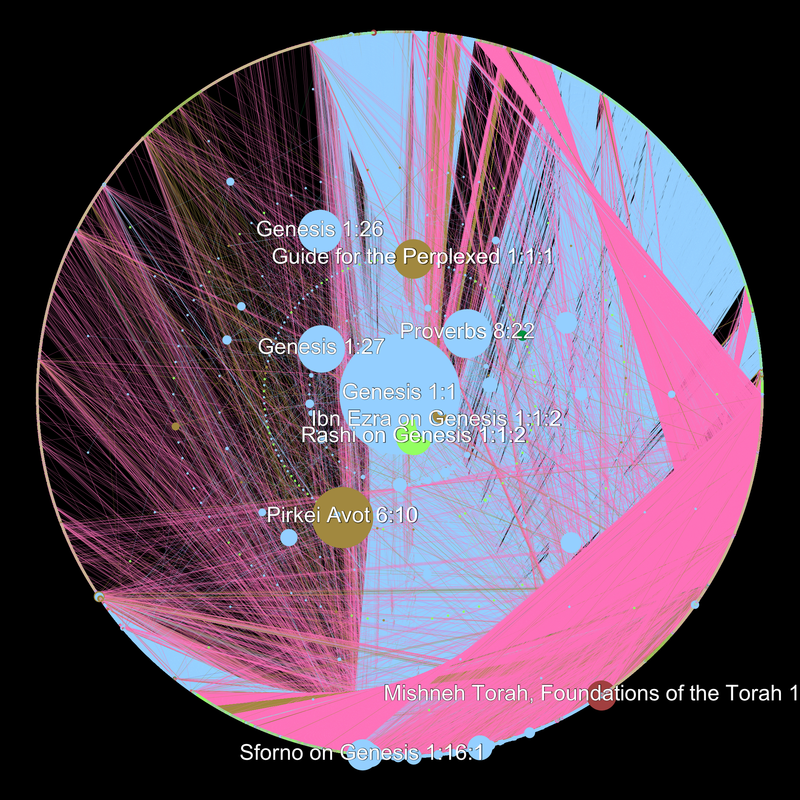 Conveniently, when I excluded the translations, I found only 4% of Tanach nodes had one edge. So the math works out nicely and there’s our 37%. Some off the cuff Sefaria testing also suggests that some of these numbers are not accurate. There are some verses listed in my 1 degree column that clearly have more than one connection on the site itself. But that may be an artifact of the work that continues to be done on the site. Current stats from the site say that they’re up to 400,000 edges. Perhaps it’s time for another multicolored Eye of Sauron. As my readers have undoubtedly noticed, these forays into visualization are not focused on specific research agendas. I’m using this space to figure out what it means to work with visualizations in the humanities, what kind of work they can do and what we can ask of them. I don’t want answers, I simply want new and interesting questions. And I want to work with the texts on a visceral level, something that makes creating these visualizations surprisingly rewarding. I know that all the work we do is about creating knowledge, but it feels more visceral when I can watch the shape and size of the textual representations change on the screen. Taking ownership and making knowledge in full technicolor is what we’re all about here. I’m not usually a prolific tweeter. I tend to find between 1 and 5 interesting tweets each day (or every other week when I get distracted) and retweet them. But Tuesday, as those of you who follow me might have noticed, was an exception. I decided to try my hand at live tweeting the end-of-quarter project presentations in Alan Liu’s ENGL 236 class, “Introduction to the Digital Humanities”. The assignment: write up a detailed grant proposal for a Digital Humanities project and, if possible, provide a small prototype . The results were spectacular and I know I did not do them justice in 420 characters (I limited myself to three tweets per project – two for the presentation and one for the Q&A). But this is not a post about my first experience live tweeting, which was quite an experience and a really valuable exercise in attention and brevity. This is a post about the assignment itself and the kinds of ideas that it generated. First, though, I should probably speak about my place in this class. I wasn’t in it. I wasn’t even officially auditing it. I just showed up every week because it was held in my* lab in between my office hours and because I was deeply curious what exactly an introduction to the digital humanities was. Additionally, as my lab responsibilities include holding office hours and providing support for those engaged in digital and new media projects, it seemed wise to remain abreast of what the class was interested in doing. That meant, however, that while everyone else was gearing up to present their final projects, I was relaxing because there was no assigned reading for the week. In one sense, I did not actually have to be there. In another sense, this was the most important class of the term. This was the class about imagining the future. This was the moment when my colleagues–many of whom probably still would not define DH as one of their fields–advanced proposals for projects that they thought were interesting, that they would find useful in their scholarly work and in whose creation they would like to participate. Obviously, this is not a representative sample, but it is an interesting starting point. What points of intersection appear in these projects? What elements of digital inquiry have been left out entirely? What kinds of things do my peers want to be able to do? If you missed the tweets, I’ve Storified them here (or you can just check #engl236). If you would like to see the actual proposals rather than simply my summaries, they can be found at Project Prospectuses along with the full text of the assignment. So here’s my take on the projects as a whole. First, the people want databases. Eleven of the fourteen projects began with the creation and maintenance of a database. Often, they proposed a database of media, sometimes crowdsourced, where as many examples as feasible of that media would be located and available for comparison. That was the second thing in common with nearly all of these database projects. Built in to the database itself were the tools necessary to sort, reorganize and analyze the data. This isn’t just about making it easy to track down the media the make up large scale analyses, it’s about making it easy to perform the analyses themselves. For example, Percy proposed a database of legal documents with a built-in stop list that specializes in sorting out the excessively common legal terms that pepper court documents, but would be meaningless from a semantic standpoint. This kind of project makes it easy for someone with little legal training to go in and work with these texts. The “hard work” of figuring out how to cope with reams of legalese has already been done. Here’s another example. Dalia and Nicole suggested a database of fairy tales called Digitales that aims to collect multiple versions of each fairy tale–both published and crowd-sourced versions in order to try and maintain a sense of transmission and orality–and includes tools that compare different versions of the same story as well as tools to compare the same figure across multiple tales. One could, I imagine, discover once and for all, “what does the fox say?” There are tools for this kind of analysis out there and similar kinds of databases as well. But a nontrivial amount of effort goes in to finding, cleaning and uploading the text…and then debugging the analyses. And, because all the systems in place to disseminate pre-cleaned texts are still invisible to the average scholar, this process is either repeated every time a new student wishes to study something or dismissed as too complex. ** A project like this makes it easy to do research that, as of now, is still something of a pipe dream for most scholars. Digitales will also include a timeline element so that the user can trace the evolution of a particular story over the ages. This is one of several projects (5, if I recall correctly) that are interested in spatializing and temporalizing knowledge. Nissa’s project, DIEGeo, aims to not only collect data on early 20th century, expatriated writers from the paper trails they leave behind, but also create an interactive timeline that displays which writers were where at what point in time. 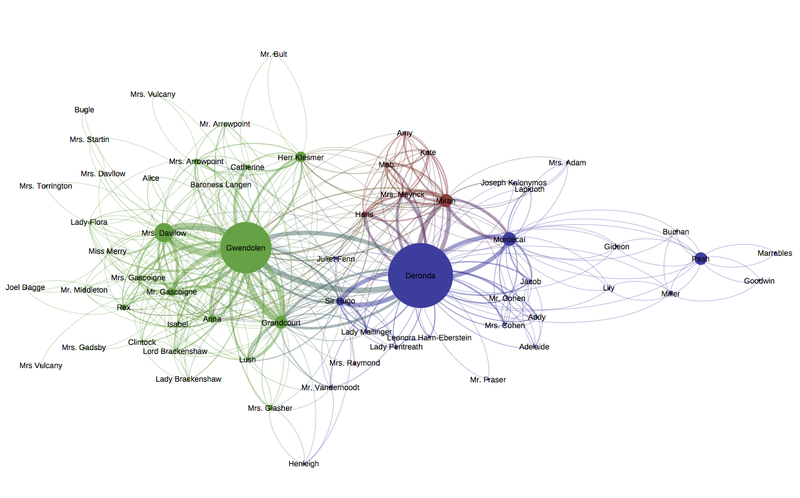 As with the fairy tale database, DIEGeo wants to literalize the way we “see” connections between authors. We can observe how the interwar authors move through time and space (without the use of a TARDIS), which opens up new avenues of charting influence and rethinking interactions. Display, see, watch…these are are the verbs that make up these projects. I’ll throw in one more–look. These projects change the way we look at knowledge production. They prioritize organizing the texts and images and (meta)data that make up our cultural and textual artifacts in such a way that it becomes easy to ask new questions merely by looking at them. Because the preliminary research is already done (mapping all of French New Wave cinema in real and imaginary space, e.g. ), it becomes possible to start asking larger scale questions that investigate more complex forms of interaction. So here are the questions that humanists would be asking if the infrastructure was up to it. These are all projects that are buildable in theory (and, in Gabe’s case, in practice), but that require serious computational and infrastructural support. A lone scholar could never build one of these and, even having built it, afford to maintain it. But, these projects seem to say, just think of the critical and pedagogical opportunities that would arise if we had these databases at our disposal. Now for the flip side of the question. What is absent? With the very notable exception of Juan’s ToMMI (pronounced toe-me) tool for topic modeling images, there were no analytic tools proposed. Many of the databases incorporated already extant tools (and, in a larger sense of the term, one could argue that the database itself is a tool). Still, in retrospect, I’m surprised to see so few suggestions for text analysis tools or, even better, text preparation tools. Why? And here’s the bit where I extrapolate from insufficient data. I think it’s harder to conceptualize and defend a tool than a database. Many of the text analysis tools already exist and why write an $80,000 grant proposal for something that someone else has already done? On the other hand, how do you conceptualize a tool that hasn’t been invented yet? What would an all-in-one text prep tool look like? *** And would it even be possible to create one? And, even if you did, could you easily defend why it was interesting until you actually used it to produce knowledge? I can make an argument for the particular kind of knowledge that each of these projects creates/uncovers/teaches. But the tools that we need to make text analysis approachable are difficult to argue for because the argument comes down to “this makes text analysis easy and that will, hopefully, provide interesting data”. As Jeremy Douglass, the head of Transcriptions, points out, many digital projects begin with the goal of answering critically inflected questions about the media they study and quickly become investigations into the logistics of building the project. This is, arguably, a feature rather than a bug. As Lindsay Thomas and Alan Liu pointed out at Patrik Svensson’s talk on “Big Digital Humanities”, our problem with data isn’t that it’s big, it’s that it’s messy. So, to apply Jeremy’s articulation of the situation in a way that hits close to home for me, the first question one must answer when transforming one or several novels into social network graphs is not “what patterns of interactions do we find?” but, “does staring at someone count as an interaction?” 19th century heroes do a lot of staring. Is that a different kind of interaction from speaking? Can and should I code for that? Will a computer be able to recognize this kind of interaction? Does that matter to me? At that point, two years might have gone by and one has an article about how to train a computer to recognize staring in novels, but has barely begun thinking about the interpretive moves one had planned to make regarding patterns of interactions. This is a critical step in thinking. It helps us answer questions we never even thought to ask. It changes the way we think about and approach texts. It forces us to stretch different muscles because technological (and sociological and economic) affordances matter and constraints, as the OuLiPo movement argues, may be necessary to do something innovative. The downside is that we get caught up in answering the questions we know how to answer. Which is what is so fantastic about these project proposals and why I find them so compelling. They get to grapple with these problems without losing sight of why they do so. Corrigan dealt with this explicitly when presenting on MiRa, her mixed race film database. How, she asks, do we construct a database of mixed race when race itself is constructed? The project becomes a way of thinking about material and cultural constructions through the making of this database that is itself both a form of critical inquiry and an object of it. Now all we need to do is get them built. But that, I think, is a task for another day. Winter break is about to begin. *For a given definition of the term. **I will easily grant that there are a number of problems with making texts that have been chunked, lemmatized, stripped of all verbs, de-named, etc. available and that doing so will open them up to misuse. I also think that the idea of a TextHub based off of Github (or even using Github for out of copyright materials) where different forms of text preparation are forked off of the original and clearly documented should be embraced by the DH community. ***I may be showing my hand here, but I really want one of these. Two weeks worth of struggling with R and putting in my own texts (feel free to guess which one I used) has left me feeling less accomplished than I would have liked, but less filled with encroaching terror as well. I am capable of following instructions and getting results, so while the art of doing new things (and really understanding the R help files) is still beyond me, I think I have enough material to start talking about Daniel Deronda again. Daniel Deronda is a text that seems split into two halves. One of the things I discover when I reread this book is that there are many more chapters than I remember with both Deronda and Gwendolen “on screen together”. So are these two separate stories or are they two utterly intertwined texts? 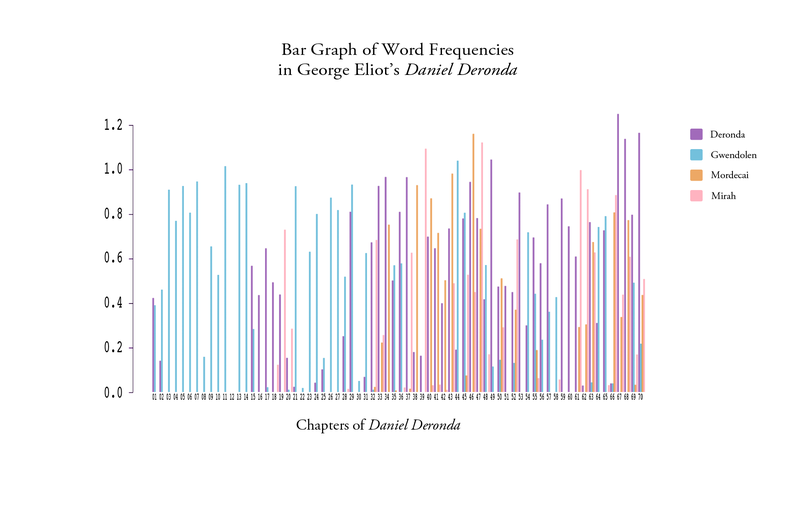 In order to test how separate the two storylines are, I looked at the word frequencies of both “Deronda” and “Gwendolen” in each chapter to see whether they were correlated. So, in this case, a positive value means that Deronda showing up in a chapter increases the likelihood of Gwendolen showing up while a negative correlation means the opposite. So if the frequency of each name per chapter was distributed randomly, you would be statistically likely to see little correlation between them. 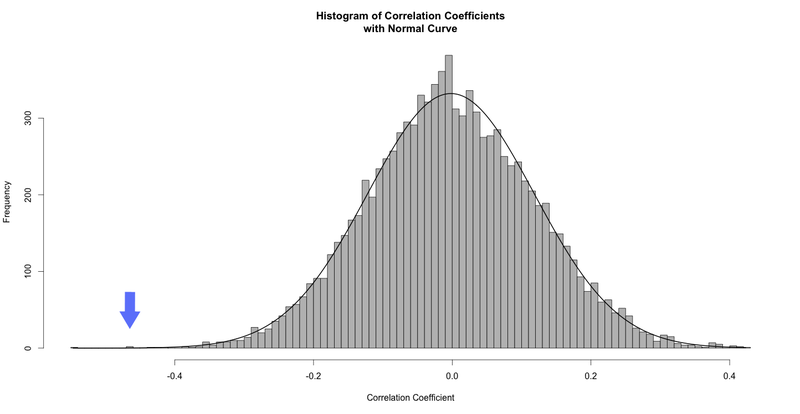 For those interested in some more specific numbers, the mean is -0.001858045 and the standard deviation is 0.1200705, which puts our results over 3 standard deviations away from the mean. That little blue arrow is -0.465. All that says, of course, is that it’s highly unlikely that these results occurred by chance and that they are, in some sense, significant. * Which, to be fair, no kidding. My initial, subjective reading told me they were negatively correlated as well. And there has to be a better reason to do this kind of work than just to prove one’s subjective reading was right. Which is where our next graph comes in. Now that I know that the two are negatively correlated, I can turn to the actual word frequency per chapter and see what the novel looks like if you study character appearance. And, for fun, I threw in two other characters who I see as central to the plot to see how they relate. I highly recommend clicking on the graph to see a larger view. Here’s where things get interesting to the human involved. The beginning of the novel happened exactly as expected – Eliot starts the story in medias res and then goes back to first tell us Gwendolen’s history and then Deronda’s. And then the name game gets more complicated about halfway through when Mirah and Mordecai** enter the picture. By the last few chapters, there is very little Gwendolen and the story has settled firmly around Deronda, Mirah and Mordecai. All of this, again, makes sense. 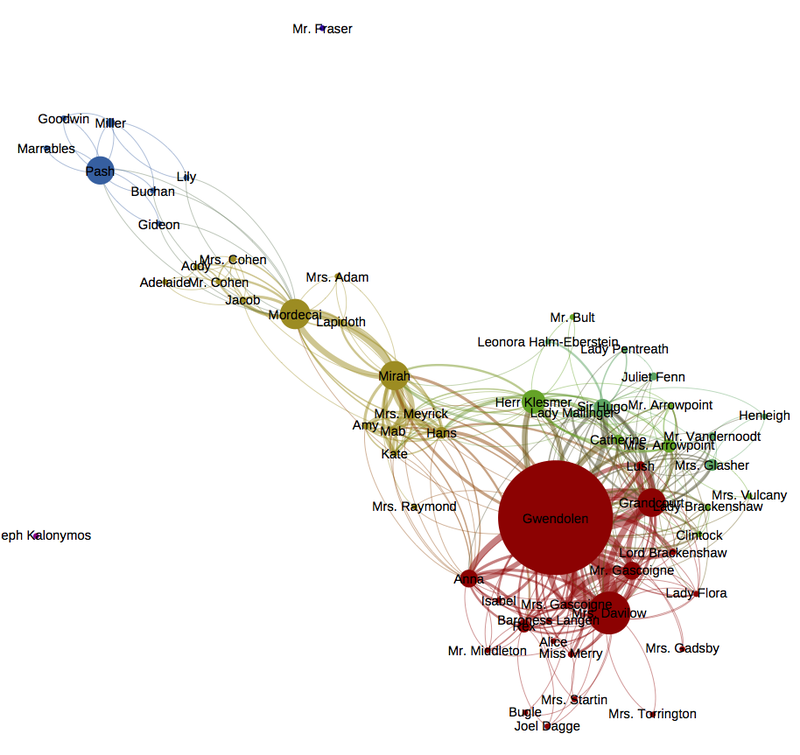 But it is nice to see the focus of the book plotted out in such a useful manner and it invites two kinds of questions. The first is based on the results; going to chapters with a surprisingly high mention of a certain character, like Deronda’s last few chapters, and attempting to figure out what might be going on that causes such results. Why, after all, is Daniel the only one to venture up into the 1.2% frequency? Is there something significant about the low results around 50 and 51? What’s going on there? The second kind of questions that this graph invites are questions about me. Why did I choose these four characters? I think of them as the four main characters in the story and yet there’s certainly a good argument to be made for at least one other character to be considered “main”. If you’ve read the book, feel free to guess who. Why did I leave out the frequency data for Henleigh Mallinger Grandcourt? Honestly, I completely forgot he was important. It’s not that I don’t remember that the Earl of Grantham had an evil streak in his youth, it’s simply that I don’t think of Grandcourt as a main character in the book. That might be because one doesn’t usually think of the villain as “the main character” or it might be because I am more interested in the story of Deronda and 19th century English Jewry. As it happens, I noticed Grandcourt’s absence because of that odd little gap in Chapter 12 where absolutely no one is mentioned. What was going on there? I went on Project Gutenberg, checked the chapter and said “Oh. Oops.” This is the only chapter entirely (and possibly at all) from Grandcourt’s perspective, hence no mention of any other character. So why didn’t I redo the graph with Grandcourt included, given that he’s important enough to have his own chapter? 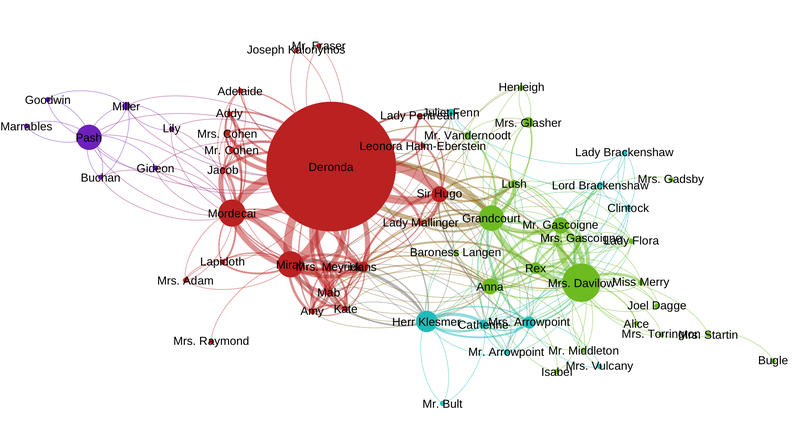 This data doesn’t exactly tell us anything new – we have ample proof from Eliot that Grandcourt is one of the nastiest husbands in the British canon. 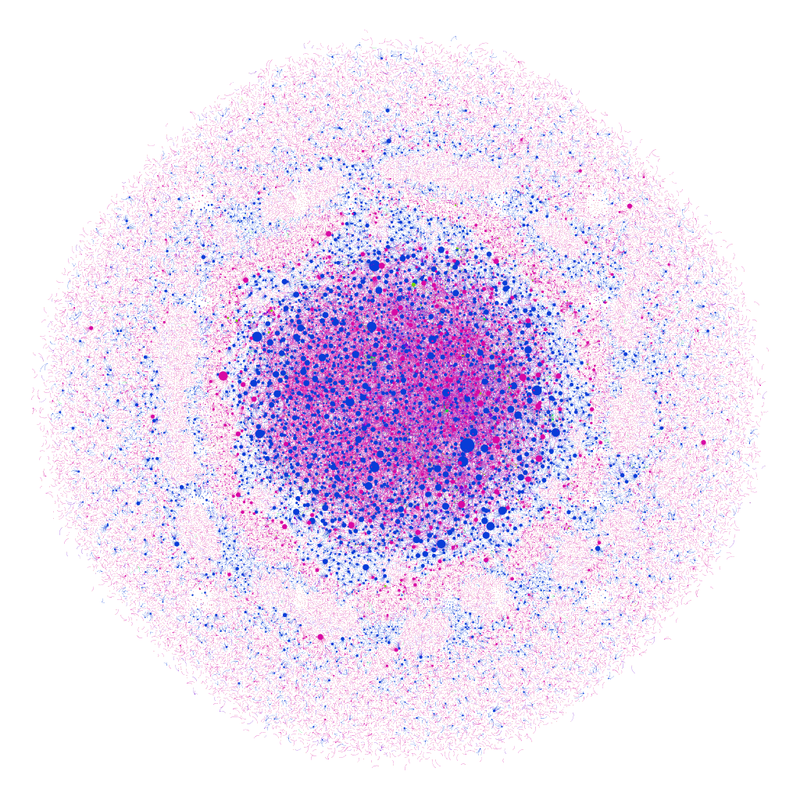 But this detail invites a way of looking at people’s interactions categorized by recognizing another person by the simple act of naming them, which makes this the second time that randomly playing around with visualizations has led me towards the question interpersonal interpellation as related to empathy. So what do you all think? What does the graph say to you? Do you think this is a valuable way of approaching a text? And am I getting kinda hung up on this question of simply naming as a measure of empathy? * With the obvious caveat that this was a book written by a woman rather than a random letter generator so of course its results did not occur by chance, what this graph really lets us see is whether the negative correlation between the two characters allows for meaningful critical discourse. Anything under -0.5 is not really considered significant in scientific terms, primarily because it’s not useful for predictive validity, but because we’re not interested in predictive validity, we’re interested in the possibilities of storyline division, the graph validates the hunch that there’s some kind of distinction. **SPOILER ALERT – Mordecai is actually the combined occurrence of the names Mordecai and Ezra, for reasons obvious to anyone who has read the book.